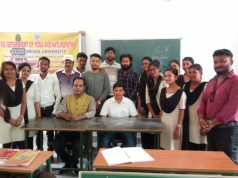 Bhubaneswar: A one-day workshop organized by the Srinovation Club of Sri Sri University, Cuttack Odisha. Shri Saswat Mishra, IAS, Commissioner of Commercial Taxes, Cuttack, Odisha, CA Rashmi Ranjan Mishra, Chairman, Bhubaneshwar branch of ICAI, Bhunaneshwar. 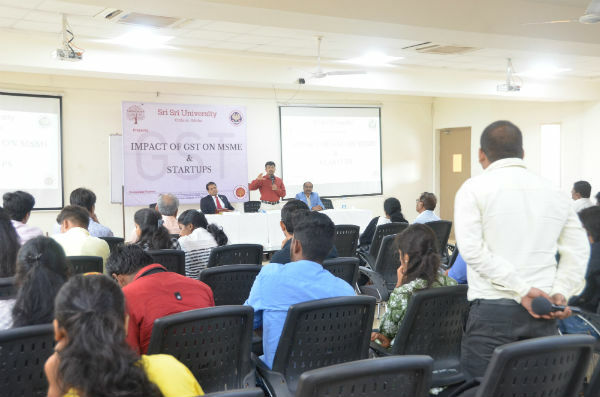 The workshop started with Dr. Subbarao welcoming the crowd and also thanked Mr. Rashmi and Mr. Saswat for coming to the university and addressing the students and the industrial entrepreneurs. He thanked Prof. Nand Lal for making this workshop happen since it was the need of the hour where people from the msme sector understand the taxation system under the new roof called GST since 8% of India’s total GDP comes from the msme sector and almost 8000 products are produced from such startups. He congratulated the Srinovation team for making this a grand success in such short period of time. And also informed that GST will be a part of the syllabus for the students of MBA from the next semester. He inspired the students to ask questions and clear their doubts from the experts available all the day. This was followed by Mr. Saswat Mishra clearing the confusion that the parliament only, made the GST law. It was the Parliament who made the Integrated GST law and the Central GST law while the state GST law was made by respective finance departments of all the states. He mentioned about the people’s wrong mentality that the GST is complicated hence are not registering even if they are coming under the respective threshold limits. GST is a national law and should not be escaped from. The Srinovation club was encouraged to take charge and conduct a 15 days’ workshop and tie-up with the ICAI, Bhubaneshwar since today’s workshop would provide hardly any knowledge about the GST in total. According to Mr. Saswat Mishra, GST practitioners have a great future since it will stay in the taxation system for about 20 to 30 years. He encouraged the students to open their own firms and become GST consultants just after graduating from B-schools since this is the time when people will need such GST experts. After an informative session from Mr. Saswat Mishra the students and industry businessmen had the opportunity to listen to Mr. Rashmi Ranjan Mishra, where he believed that the right approach to share knowledge is the informal way and kept a funnier approach to interact with the crowd. He always kept a certain wavelength while speaking to students and with industrial traders and entrepreneurs. Advantages of GST included escaping the cascading effect and elimination from double taxation (multiplicity) effect. 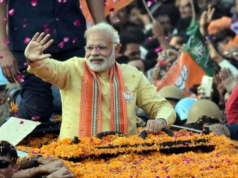 He cleared doubts about different threshold limits for different states and also mentioned about Jammu and Kashmir being included in the GST law since this was the first time J&K has been included under the system which was barred from any law applicability before time. Mr. Rashmi Ranjan Mishra also explained the concept of composition scheme. He too encouraged the young and dynamic students to become entrepreneurs since only then they would understand GST to the core since sitting on a river bank does not make one a swimmer only jumping in the river makes you one. The whole address was then followed by a dynamic Q & A session from the students and the responses from the speakers helped the students even more to get deeper in understanding GST. A quiz was organized at the end so that the Srinovation club would get an idea on the impact of this workshop on student’s mind.